A couple of years ago I joined a great free website called SparkPeople.com. It's a great resource that provides you with all the tools you need to lose weight, get in shape and lead a healthier life. The have nutrition and fitness trackers, recipes, a great community with "Teams", message boards, articles. Everything it takes for you to reach your goal. Over the course of several months I lost about 25 pounds, trained to run a 13.1 mile half marathon and learned a lot about cooking healthy meals for my family. As time passed, counting calories didn't seem to be quite as important as it was while I was actively losing weight. Then I tore my hamstring and had to stop exercising for awhile. For some reason I didn't feel like I needed to cut back on what I was eating and as a result I gained back all of the weight I'd lost and then some. I used this blog as an excuse to eat what I wanted, when I wanted and got away from my original goal of creating healthy dishes that taste great. Well, now that cold weather has arrived here in the Midwest, I got a wake up call when I realized that after a summer of wearing shorts, non of my long pants fit and many of my long-sleeved shirts are a little on the tight side. Time to get serious! I logged back into SparkPeople (If you check it out, look for me. My name is tbarton. I post a lot on the message boards and I also promise to post to my Spark Blog often! LOL!) 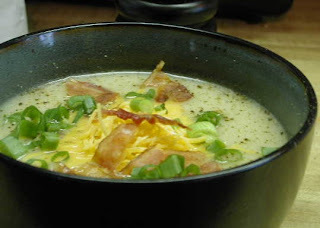 This Loaded Baked Potato Soup certainly doesn't look like a diet dish, but even with a topping of cheese and bacon, it's about 200 calories per serving! Woohoo! Mel also suggests topping it with things like chopped spinach, steamed broccoli, fresh tomatoes or even jalapenos. All which only up it's healthy quotient. Woohoo! It's delicious secret is that rather than using whipping cream to give it that silky goodness, it calls for plain yogurt. At first I was a bit apprehensive. I'm not a real fan of yogurt unless it's disguised with lots of fruity flavor. I needn't have worried. It was delicious! It's easy to make as well so I know this is one soup that I'll be making often this fall! The best part is that this Loaded Baked Potato Soup helped my stay within my calorie range for my first official day back at Spark. Thanks Mel! Anything you like to put on your baked potato goes! Set a large, heavy-bottomed pot over medium heat. Once it’s hot, add the oil, onion and garlic and cook for 5 minutes, or until the onions are just starting to become translucent. Add the diced potatoes and simmer for another couple of minutes, then add the chicken stock. Let the stock come to a simmer, then reduce the heat to medium-low, cover and cook for 20 – 30 minutes, or until the potatoes are tender. Remove from heat and stir in the yogurt. Transfer half of the soup to a blender (or use an immersion blender) to puree about half of the soup. The potatoes should still be somewhat chunky, but also creamy.